Born: 26 August 1853, Brackley, Northamptonshire, England. Died: 28 June 1930, Cape Town, South Africa. Albert (or Albert Edward) Walsh, a Cape pharmacist, was educated at the Applebey and Brackley Grammar Schools in England and then served an apprenticeship with the pharmaceutical firm of John Bell in London. He obtain both the minor and major certificates of the Pharmaceutical Society of Great Britain and qualified as a pharmaceutical chemist (Ph C) in 1874. For some time he worked as an assistant to T.M. Clarke at Richmond, Surrey, and married one of Clarke's daughters. 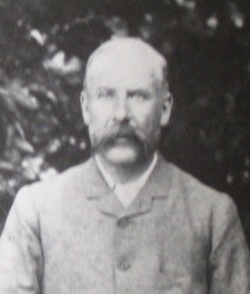 Walsh came to the Cape Colony in 1877 and was registered to practice as a chemist and druggist on 17 October that year. After spending three years in Uitenhage he became manager of the Port Elizabeth branch of B.G. Lennon & Co in 1880. He remained in Port Elizabeth until 1902. During these years he served on the Town Council for many years and as chairman of its finance committee, was a member of the local Chamber of Commerce, and played an active role in public affairs. In February 1882 he became a member of the Eastern Province Naturalists Society, which had been founded the previous month. He was elected a member of its committee at the annual general meeting in January 1888, and as vice-president in January 1889 and again a year later. From 1888 to 1890 he served also as curator of the society's herbarium, on which he reported at the annual general meetings in January 1889 and January 1890. At the latter meeting he stated that few specimens had been added to the herbarium and that he personally had found little time to collect plants. He was a keen horticulturalist who possessed a fine collection of orchids and ferns and brought a number of indigenous plants into cultivation. In pharmacy his principal interest was in medicinal plants. The plant species Agapanthus walshii was named after him by H.M.L. Bolus. By 1896 Walsh was president of the Amateur Photographic Society of Port Elizabeth. On 13 August that year, having obtained the necessary apparatus from England (a Crookes tube and high tension coil) he became only the second person in southern African to demonstrate the generation and use of R?ntgen rays (X-rays) - the first havin been C.H. Perrins* during the previous month. He was assisted by William E. Alcock*. A reporter of the Port Elizabeth Telegraph was also present and wrote a vivid description of the experiment. A photograph of Walsh's hand was taken with a six minute exposure: "The bones came out so clearly that a tinge of light could be seen between the joints. A faint shadow round the bones represented the fleshy part of the hand. A gold ring worn on the finger was as clearly depicted as though it had been photographed by the ordinary process. There was no doubt about it. The X rays had done their work well the first time they had been called into requisition in this town" (Port Elizabeth Telegraph, 15 August 1896, p. 3). In September-October 1891 Walsh was elected a member of the first Pharmacy Board of the Cape Colony. He became its president in January 1909 and held this position to his retirement in 1921. Meanwhile in 1899 he became general manager of Lennon Ltd and in 1902 moved to Cape Town, settling in Kenilworth. He joined the local Chamber of Commerce and served as its president for 1907. He was also a member of the Table Bay Harbour Board. In 1900 he became a member of the South African Philosophical Society and remained a member when it became the Royal Society of South Africa in 1908. He was also a foundation member of the South African Association for the Advancement of Science (established in 1902), while both his wife and daughter were associate members. He served on its publication committee for 1903/4, and on its council from the beginning to 1918. From 1910 he was the Association's general treasurer. In 1905 he became a member also of the British Association for the Advancement of Science. Albert Walsh should not be confused with Albert Edward Walsh, who died in the Cape Province in 1946. He may, however, be the same person as Albert E. Walsh who registered as a chemist and druggist in the Transvaal Colony in 1906. Albert Edward Walsh. South African Journal of Science, 1931, Vol. 28, p. 597. Eastern Province Naturalists' Society. Minute Book [No. 1], January 1882 - May 1885; [No. 2], August 1885 - March 1892. (Africana collection, Port Elizabeth Library). Immelman, R.F.M. Men of Good Hope. The romantic story of the Cape Town Chamber of Commerce, 1804-1954. Cape Town: Chamber of Commerce, 1955. National Automated Archival Information Retrieval System (NAAIRS). . Documents relating to Walsh, Albert / Walsh, Albert Edward / Walsh, Albert E.
Plug, C. The introduction of r?ntgen rays and radiography into South Africa. Adler Museum Bulletin, 2001, Vol. 27(1), pp. 4-10. Port Elizabeth Telegraph and Eastern Province Standard, 15 August 1896, p. 3, The R?ntgen rays in Port Elizabeth. A first experiment. (Reprinted in the Cape Times, 20 August 1896, p. 7).